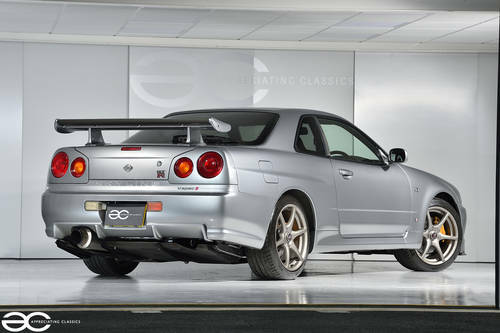 With ‘The Gran Turismo era’ cars climbing in value quickly over the last 12-24 months, R34 GTR’s are in serious demand and are tipped as a fantastic future investment. Being a V Spec II makes this example all the more sought after. 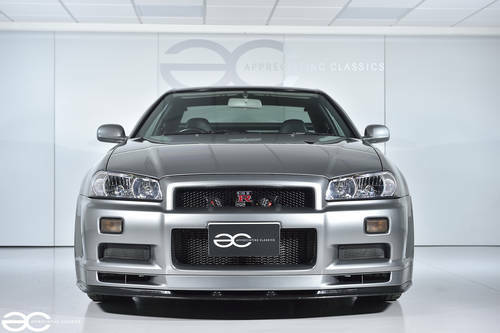 We are very proud to offer here, a Nissan Skyline R34 GTR V Spec II in fantastic condition throughout, and with only 39k miles from new, this fantastic example would look at home in any serious car collection, or indeed this example is ready to be enjoyed as a weekend luxury. 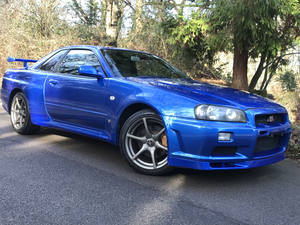 The R34 GTR is a special car itself, but a V Spec II with this mileage, and in largely original condition (a couple of minor upgrade parts have been fitted – detailed below) is very rare, and becoming ever more sought after. We have many more pictures which are available upon request. Quite often with Japanese imported vehicles, the history is missing or can be patchy at best….making potential buyers a little weary. Thankfully we have no such issue here, with the original service book being present, showing great care over the 16 years of this cars life. 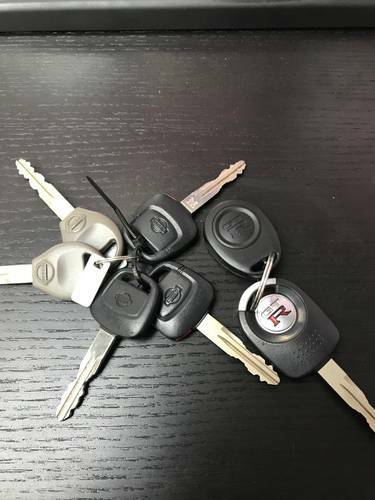 Also within the file is a Japanese HPI which we have carried out, and the original keys (all 6 of them) with the correct original GTR fob. Also included is the auction sheet which states the grading as 4B. In 2015 the car was imported with 61,625 km’s, which equates to 38,292 miles. At this point the car was converted to read in mph from this point on wards, which is standard procedure with Japanese imports. This equates to 39,990 miles total. Finished in Sparkling Silver, this example presents very well indeed throughout. The original carbon fibre bonnet is still fitted, and is in great condition. No bodywork changes have been made, the original spoiler, splitter and carbon fibre rear diffuser are all still in place. Anybody familiar with these vehicles will know that the headlights tend to suffer, turning ‘yellow’ and/or ‘crazing’.. you only need to look at the condition of the headlights on this example, to understand the kind of condition this car is in. All badges are in good condition, as is the glass and the original wheels, with just a couple of small marks present on the nearside rear wheel. 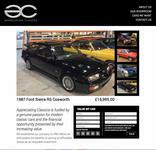 This car represents its low mileage very well, and is a very honest and very clean example. The underside is still in very nice condition also, having only covered 1,700 dry miles in the UK since 2015, so the underside still maintains the ‘fresh import’ condition – pictures are available on request. In terms or any marks to the bodywork, it has a couple of very small chips to the offside front wheel arch (where a stone has flicked up) and a small mark on the edge of the nearside rear arch – pictures available on request. The interior of this car is as per the rest of the car… fantastic. Open the door to step in, and you are aware that you are stepping in to, what is arguably the ultimate 90’s/00’s Japanese Performance Machine. 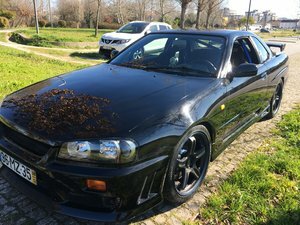 Until the V Spec II the R34 had not seen the black trim, and it suits the car perfectly, along with the aluminium pedals, Nismo clocks, and of course the LCD multifuction display which works perfectly, with all information being displayed correctly. 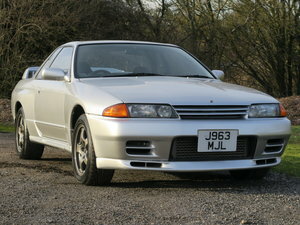 Original floor mats are still in place, GTR sill plates are in great condition, and all seats are in superb condition, with the drivers seat bolster retaining its shape, and still being firm as you would hope with no signs of wear. The rear seats looks as though they have had barely any usage at all. The gearknob is ‘as new’ and the steering wheel is in good condition. A fantastic place to be, with technology reminding you, exactly what it is that you are driving. 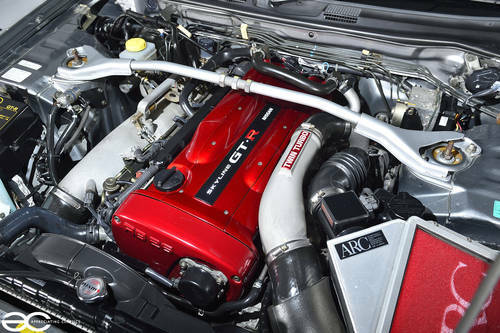 The iconic RB26DETT engine… if you know your Japanese Performance cars then you know this engine, and how it is held in high regard for being one of the best engine’s to come out of Japan. With only 39k miles from new, this engine is still extremely fresh, and runs beautifully. Turn the key and the car starts without any hesitation, and with no smoking…. these engine’s can run a little noisy when cold but this example is nice and quiet even when cold. On the road the car performs very well, giving strong, yet smooth acceleration through the rev range… whilst making a fantastic noise might we add. 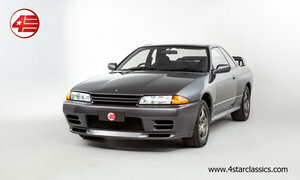 The only additions here are an ARC intake system, an ARC cooling panel, and a Ganador Titanium exhaust. The engine bay itself presents very well, showing that the car has been cherished, and treated as the pride and joy that it is. 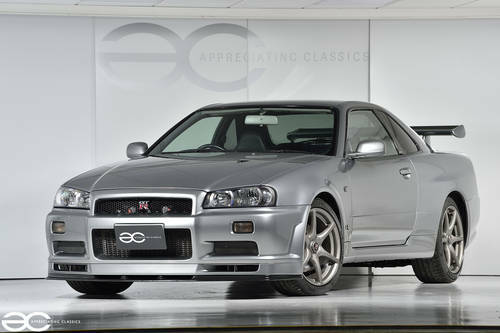 Of course, this car drives fantastic…it is a R34 GTR so you expect it to impress! HKS coilover suspension has been fitted, and genuinely do not feel ‘harsh’, in fact you could be forgiven for thinking it is the original suspension. Great handling of course… and this is maintained with the addition of Michelin Pilot Sport 4 tyres, which were fitted new in 2017. No unwanted noises at all, just a pure pleasure to drive with great braking and handling capabilities. The clutch and gearbox are a joy to use, being user friendly yet performance orientated.